Kitchen remodeling in Fullerton CA can be a big investment. It’s important to trust your investment to a true professional like Cabinet Magic. As a licensed contractor, we can take you through every phase of the project with ease, from the initial design planning to sourcing the best designer materials–including custom cabinetry–to installing and finishing everything to a high standard. 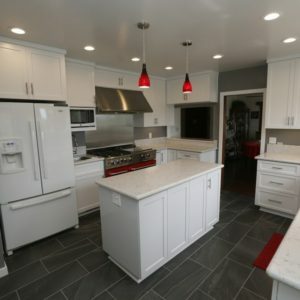 Kitchen remodeling in Fullerton CA can range from simply updating the room with new cabinets, fixtures, and accessories to totally redesigning the floor plan. In either case, you may be concerned about how the finished project will turn out. After all, samples can look quite different in your hand than installed in your kitchen. At Cabinet Magic, we believe being able to accurately visualize your kitchen remodeling in Fullerton CA before work begins is key to being satisfied with the final result. That’s why we use computer rendering software to create detailed 3D images showing what the finished remodel will look like. We’re happy to create multiple versions of the design so you can easily compare different options. We never begin work without your sign off and approval of every detail of the design. Take the first step towards beginning your kitchen remodeling in Fullerton CA today by contacting Cabinet Magic at 800-828-4380 and requesting your free in home consultation. We can help you price the upgrades you want and give you a free estimate.